It’s been 20 years of /juːɛt/ climate conferences, and yet there still hasn’t been an agreement on who should pay for climate change loss and damages. 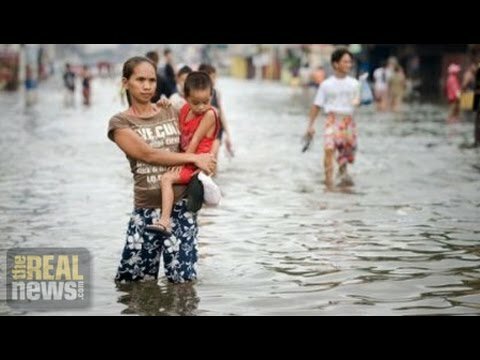 Following the recent COP 20 in Lima, Peru, critics have pointed out that the final agreement failed to answer that question, despite immediate effects of climate change being felt right now through severe storms and droughts. Many say rich nations should front the bill for these storms that you’re seeing here, since these industrialized countries have contributed to the vast majority of carbon emissions. Another approach is to go after corporations directly. We’re talking about the 90 greatest emitters, like ChevronTexaco, ExxonMobil, and Saudi Aramco. And according to the climate justice program, these companies have emitted more than 60 percent of the world’s total carbon emissions. But even if you were to go after governments and corporations, how would you get them to be accountable? Here to break down their models for climate change accountability are our two guests. Now joining us from Canada is Andrew Gage. Andrew is a staff lawyer with West Coast Environmental Law. He cowrote the report Payback Time? which looks at how transnational climate lawsuits go after Canadian oil and gas companies. Also joining us from California is Tom Athanasiou. Tom directs the activist think tank EcoEquity, and he’s a writer and organizer. Thank you both, gentlemen, for joining us. Let’s kick off this discussions with what we know, gentlemen. Climate change is happening. It’s not just my opinion or your opinion. But a recent NASA study found that 97 percent of scientists agree and that climate change is very likely due to human activities. You both have different ways about how to hold some of these biggest carbon emitters accountable. Andrew, let’s start off with you. Your paper looked at holding corporations accountable. Walk us through how that would actually be done. ANDREW GAGE, STAFF LAWYER, WEST COAST ENVIRONMENTAL LAW: Well, there have been efforts already to sue corporations in the U.S. courts. They haven’t been successful. But what Payback Time? looked at is the possibility that these types of lawsuits might spread outside the U.S. and that we could see lawsuits against major greenhouse gas producers and against fossil fuel companies originating not just in the U.S., but also in Canada or in Brazil, where one commentator called their legal system a promised land for climate liability, or in countries around the world that have a host of different legal systems, that have different things to say about climate liability. And I think the insight that we bring to it is to sort of say, these countries, people in these countries don’t need to wait for the international negotiations to work that out. There are remedies that their own courts–they could pursue their own courts. And that is actually a very major risk for the carbon majors and other large-scale greenhouse gas polluters. DESVARIEUX: Can you speak to those laws and that court system that you’re referring to? GAGE: Well, Brazil is just one example. They have rules in Brazil that impose strict liability for environmental offenses or environmental wrongs, meaning that you don’t have to show that they did something negligently or that they somehow were careless. It’s enough that they caused the harm and that Brazilian law will at least in principle hold them accountable. There’s also countries around the world that have a constitutional right to a healthy environment embedded in their constitutions. And in at least some of those countries it is likely that those laws, those rights, constitutional rights, could be brought to bear against private corporations as well as against their own governments. DESVARIEUX: But, Andrew, what about those governments that might not have those laws on the book? I mean, some might argue that you would have to go through the legislative process, and that’s quite a slow process. So what do you make of that argument? Maybe we don’t have enough time for that. GAGE: Well, certainly in Payback Time? we do look at the possibility that countries might /əˈbɛn/ their laws to clarify the rules around suing carbon majors or fossil fuel companies. And, I mean, it depends on the legislative system. I mean, laws can be passed fairly quickly if a government puts its mind to it and if people demand it and it’s viewed as a political or a real necessity. So it’s a lot quicker for a country to do that on their own than to get those issues resolved through international negotiations. And once you have a judgment, whether from a court in one of these countries, at least under Canadian law and the law of, I think, many countries, it’s actually possible to enforce that judgment as an international debt, which makes collecting on those awards possible even for countries that don’t have those fossil fuel companies operating within their borders. DESVARIEUX: Alright. So, Tom, you kind of just heard Andrew lay out his model. Let’s talk about your model. First of all, do you agree with that system that he’s talking about, going through the courts? Is that the way we could be going about this? TOM ATHANASIOU, DIRECTOR, ECOEQUITY: Well, I mean, the courts have not traditionally played a very large role in the international climate finance debate. But nothing has worked so far. And you have to understand the scale of what we’re talking about. What we have to do is we have to phase out carbon fuels globally in 40 years, 50 years, something like that. It’s going to be tremendously difficult and tremendously expensive. And it has to take place in this very starkly divided rich-poor North-South world. And we need money for adaptation. We need money for loss and damage. We need money for rebuilding the planetary infrastructure. And all three pots of money that we need are in the hundreds of billions of dollars a year category. So some of it’s going to be investment, but a lot of it’s got to be private money. It’s a lot of money we’re talking about. DESVARIEUX: So you say–hold on, Tom. You’re saying private money, so we’re talking about corporations, going after them. So what would that–how would you do that? ANTHANASIOU: That’s right. So the basic idea that is floating around in this space is to go after the corporates on legal liability, because when you look at the problem of loss and damage, a lot of that is caused not by national actors or individual actors but by corporations. And it’s a great idea, and it’s a really instructive idea. I don’t know how far it’s going to get in the international negotiations if there’s not a breakthrough in the negotiations. And that breakthrough is only going to happen if it happens based on a generalized sense that things are being done in a fair way. So it’s a tremendously complicated issue. But going after the carbon majors is a really good idea. We’ll see how it goes. DESVARIEUX: Okay. Another carbon major, but not in this study, but is the government, the defense industry in particular, especially for the United States. How would you plan going after the governments of these countries, industrialized nations? I’m going to ask you first, Andrew. GAGE: Well, I mean, in terms of the court process, that is a very real challenge. The courts recognize, most countries’ courts will recognize the ability of their courts to consider disputes involving private parties. But when it comes to governments, there is a concept of sovereign immunity that prevents that type of court case from going ahead in most countries. So I do think that that is something that will have to be canvassed more at the international level. I also–I want to make it clear that we talk about the courts being an option in Payback Time? That doesn’t mean that’s the only place this discussion will take place, or that it should. You know, litigation’s an expensive option. If this conversation’s happening in the courts, it’s going to be because the international negotiations have failed to consider those issues appropriately. And the public needs to put pressure on governments to resolve these issues internationally. DESVARIEUX: Tom, what do you recommend? How do we hold governments responsible? ANTHANASIOU: Well, I mean, the governments are sovereign entities, right? I mean, they have to hold each other responsible. What’s going on in the climate negotiations now is that people have realized that there isn’t going to be a top-down deal in which the United Nations, acting as a world government of some sort, imposes targets and timetables on countries. It’s just not going to work that way. So the problem is how to get the governments of the world to negotiate and execute on transition plans that are extremely challenging, and to do those transition plans in a way that is acceptably fair. And one can argue that an acceptably fair transition is by definition going to be one in which these incredibly powerful transnational economic entities pay a good deal of the transition costs. They’re not going to want to do it, particularly since there are going to be many of them in the process of being phased out, because let’s not forget that what we’re talking about here is phasing out fossil fuels. So really it’s going to be an extremely challenging prospect. That said, historical responsibility, liability, blame, these are all very relevant notions. DESVARIEUX: Alright, gentlemen. I’m going to throw out a hypothetical. What do you do in the case of countries that sort of blur this line between government and corporation? For example, countries like Venezuela, Saudi Arabia, their government actually runs the national oil company. So how do you hold countries and corporations like that accountable? I’ll ask you, Andrew. GAGE: Well, and again, that’s the real problem. And the private companies only represent about a third of the emissions from those 90 companies that you’re talking about. So I think that in terms of turning to the courts, there’s some legitimate questions about where it’s a legally separate entity, whether or not you may still be able to pursue, at least in the courts of some countries, actions against Saudi Aramco or other state-owned companies. But certainly, as I said before, I don’t think that there are–where it’s actually the state itself, in the case of China, that’s responsible for a large–or the former Soviet Union, it’s probably less relevant now–is responsible for a large portion of the emissions. That’s something that I think ultimately probably cannot be dealt with through the domestic courts. It has to be dealt with through potentially international courts or through international negotiations. DESVARIEUX: So if international courts then take over, are they the ones policing them? Who would actually be holding them accountable, Andrew? GAGE: It would involve, I think, as Tom said earlier, the countries holding each other accountable. DESVARIEUX: Okay. Alright. I have a question for you both. Many sort of see what is going on between the government and corporations, them being sort of in bed with each other. We saw that with the passing of new budget, which gave Wall Street a big break in the derivatives market, and also cuts to the EPA, which are largely supported by non-renewable energy companies. I’m going to start off with you, Tom. Do you have confidence that the government would actually go after these corporations? What will motivate them to act? ANTHANASIOU: Well, I mean, that’s really good question. And again I have to go to the top of the step. We’re going into an emergency transition. We’re talking about an emergency mobilization. This has to be kept in mind. If we don’t phase out fossil fuels in 20 years on your show, you’re not going to be talking about anything else but climate change. It’s a situation that is going to have to be dealt with at the highest level. In that context, strategies like this makes sense, because they’re tools in the government’s toolkit. But as things stand today, where the corporates are basically able to control governments in many instances, though not in all instances, of course, it’s much more problematic. DESVARIEUX: Andrew, same question to you. What’s going to get these sort of fat cats and government officials to not be in bed with each other and actually motivate the government to go after corporations? GAGE: Yeah. Well, I think, I mean, one of the reasons that court cases haven’t been successful, I think, in the U.S. is because your economy, just as is the case in Canada, is so dependent on fossil fuels. And so, whether it be judges or government, they don’t feel that there is an alternative. And so it’s very difficult for the powers that be to sort of see how you can actually hold these companies accountable in that type of way. And there’s of course so much money pouring into the coffers of political parties, political candidates. So it’s a challenge. But one of the things that I think we were talking about in Payback Time? is that it’s not just the U.S. or Canada. There are countries around the world that have benefited a lot less from the fossil fuel economy. And if those governments were to turn to their own courts and seek compensation, that could both result in an order that could actually be potentially enforceable elsewhere, but regardless would strip away the fiction that climate change isn’t here and now and that these companies are not causing significant damages. But the other thing is the damages are getting worse, as Tom’s talking about, and at some point you cannot run an industry that’s business model is premised on causing hundreds of billions of dollars of damage each year and not expect conversation to emerge politically about who should be paying for that damage. At some point we’re going to–we’re not going to be able to afford not to have that conversation. And I think that’ll happen even in government. DESVARIEUX: Alright. Andrew and Tom, thank you both for joining us. GAGE: Thanks very much for having me.